Watching the burnings ordered by Bloody Mary. I'm in bed with Alice Perrers and very worried that all her wheeling and dealing is going to bring her down. Sparta circa 74 AD. And Rome circa 86 AD. And Dacia circa 86AD. And Ham circa 2010 being hungover. Its been quite a week. 17th century NY, trying to gain my freedom. In Constantinople with Lady Hester Stanhope. She's trying to convince me to leave and set sail for Egypt. I'm now on my third visit to Forks, Washington. At Norham Castle , where discussions are taking place between Edward I of England and the magnates of Scotland over the kingship of Scotland. 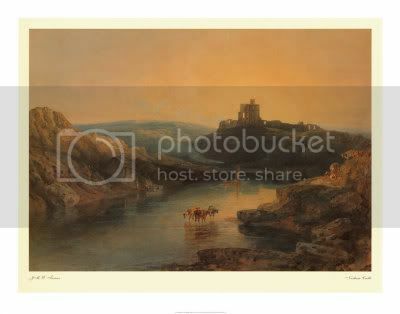 Norham Castle , as painted by William Turner. "The River Tweed carved a broad course through meadows and crop fields. The southern banks marked the end of the kingdom of England while across the wind-uffled water, on the northern bank, the kingdom of Scotland began. At a large, lazy loop in the river on the English side was the small settlement of Norham. The town, slumbering in the treacle-thick heat.of a midsummer afternoon, was dominated by a stone castle, one of the chief strongholds of Anthony Bek, the Bishop of Durham. The sheer whitewashed walls, reflected in the river’s glassy surface, were gashed with arrow slits, all facing the the reed-fringed northern bank. Hanging from the tallest turret was a scarlet banner, adorned with three golden lions." Insurrection by Robyn Young, first in a trilogy about Robert the Bruce. Last edited by annis on Sat September 25th, 2010, 8:45 pm, edited 3 times in total.